‘Debbie had me completely transported back to 12th Century Pisa, and I loved every second of it. This is my first Debbie Rix novel that I've read but it won't be the last! The author has a wonderful writing style that really transports you to the places she writes about, and the level of detail to historical facts was also really impressive. It is set over 2 periods in time - now and back in 1704. In 2017, Millie has a successful career but doesn't seem as successful in love as she's having an affair with her married boss. She knows it is wrong, especially as he has children, but she thinks she's in love. 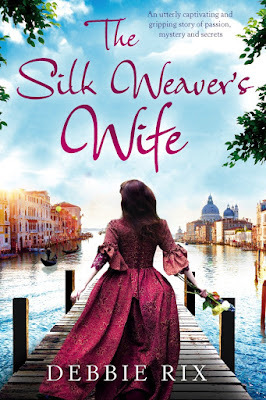 When the chance to travel to Italy arises for her to write a piece in Italy she jumps at the chance and is soon in love with more than the country! But Max is still in the background - and this is where I got quite shouty at the character as she couldn't see what was right for her!! In 1704 we follow the story of Anastasia and her family. Her father is an evil brute and makes them all live in fear. Anastasia plans to run away to marry her love, but soon finds out she is promised to another - and one brute gets replaced by another. Despite the glorious setting of Venice, she is put through an awful time after her wedding and her only thoughts are those of escape. I loved the two timeline settings - both characters had so much going on in their lives that there was always something happening. The silk weaving/farm side of the story was also fascinating and I loved the mystery of the painting that linked the 2 timelines. Happily recommend this book to anyone who loves historical fiction.